Like I said, nice little romance! Could have been nicer. It reminded me a lot of Happy Bhaag Jayegi, cute central idea, cute central actors, but somehow the rhythm isn’t quite right. The directing isn’t quite punchy enough, the performances aren’t quite big enough. I mean, it’s fine and fun and all that, but somehow it is missing the special ingredient that could jump it from Happy Bhaag Jayegi level to Bareilly Ki Barfi level. But let’s talk about what is nice about it! The romance, for one thing. This is the rare romance where the hero and heroine are on the same page the whole time. There are no stupid misunderstandings, no stupid fights, actually no fights at all! All the conflicts are external, not internal. And Karthik and Kriti have decent chemistry, I can believe they are on the same page the whole time. It’s not shocking chemistry, I’ve seen them do better in other movies and with other co-stars, but it’s okay. And, most importantly, it feels like equals. Like two people who really would mutually decide the path of their relationship, not one pushing or holding back the other. The plot (which I won’t spoil), is also very good. Unspoils in an interesting way that isn’t exactly predictable, has logical little details to explain the twists and traps, and neatly includes all the characters in the same kind of conflicts. The ending is a bit too tidy, but I will allow it. The ending also suffers from the increasingly familiar rom-com that ends before act three feeling. Like Dawaat E Ishq, like Running Shaadi, even like Befikre. Instead of taking the turn towards drama and expanding the story, it cuts off right when it is getting going. But overall, still worth watching. If you like light rom-coms and feel like killing a few hours. There is nothing actively wrong with it, even if there is nothing shockingly “right” about it either. Strangely, the thing that comes closest to being “wrong” is Pankaj Tripathi! 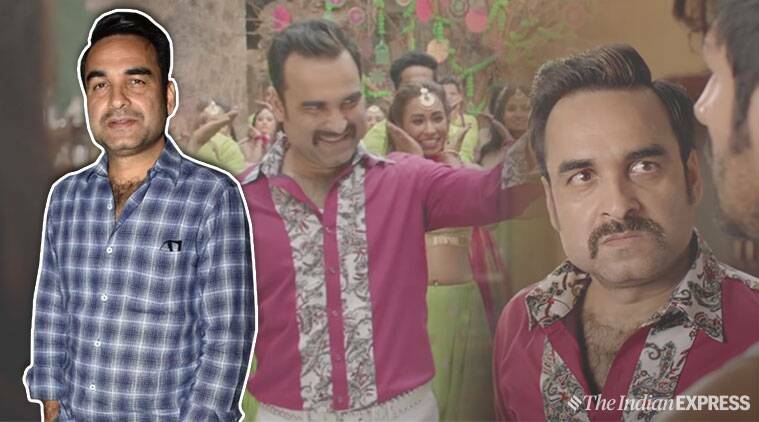 I think we may have finally reached Pankaj Tripathi overload. His character is a little too much, clothes too loud, quirks too big, I found myself rolling my eyes when he came onscreen. I think the director relied too much on Pankaj being able to pull it off, when really no one could have pulled that off. That felt mean, I’ll end with a more positive spin. Karthik successfully moves into the mainstream, keeping his comic touch but making it a little more serious and real and mature. Kriti mixes her character from Bareilly Ki Barfi with her mainstream heroine type in Dilwale and finds something that is confident and kooky but toned down to be a little more “heroine”y. So, yaaay! Two actors who came into the industry sideways, and who I like, are making another small step towards the mainstream. This entry was posted in Uncategorized and tagged Karthik Aryan, Kriti Sonam, Lukka Chuppi, Pankaj Tripathi by mredlich21. Bookmark the permalink. This one seems to be fulfilling all of my low expectations. Decent one-time watch. I’ve been watching the promotions and Kartik is a bit of a hyperactive dolt or something. I don’t find him interesting at all and his hair really is distractingly big, not just on top but all around his head! I’m all for outsiders making it in the industry, but this guy seems a bit of a lightweight. Yeah, if it had slightly better songs, slightly tighter script, slightly better all that stuff, it could have really be something. But, it didn’t. Yup strictly one-time watch. Kartik and Kriti look way too sophisticated to be bona fide residents of small-town India.They look as if they’re movie stars from Mumbai in a costume drama.Forget Ayushmann and Rajkummar Rao.They are chameleons.But even Varun Dhawan did a better job with his looks,costume,accent and body language in Sui Dhaaga and Badrinath ki dulhania. Thank you for putting a finger on what was bothering me!!!! Kriti could be believable, since her family was wealthy she studied in the city and had an urban attitude towards things, only they saddled her with this very regressive father to the point of her mother always going around veiled. How could she be this confident modern woman? And then Karthik, it almost felt like there should be a reveal that he isn’t “really” the son of the people he calls his family because he is so different from them. Eh, it’s obvious that the makers wanted to cash in on the latest trend ie shenanigans of an eccentric cast of characters in small-town. But unlike Bareilly ki barfi ,Sthree or Badhai ho, here they didn’t bother with anything beyond the superficial.It doesn’t help that Kartik and Kriti both are a little bit bland.It would have been better to pair either with a strong performer.The movie will probably be a hit but will fade to oblivion as just another rom-com..At the expense of Sonchiraiya, which had a cast which performed better and the makers went too far in the other direction -being a little bit too authentic to the subject material.The slang in the trailer itself convinced me to wait for the DVD or Netflix version with the subtitles. Oh, that makes me feel better actually! I like this kind of small light rom-coms, if this one is a success, maybe it will mean the other better rom-coms will get more attention. I’m still mad about Running Shaadi and Bareilly Ki Barfi not being as successful as they could be. His acting is pretty “soap opera cartoon villain” in this.